Light chain multiple myeloma (LCMM) (Chapter 15). Nonsecretory multiple myeloma (NSMM) (Chapter 16). Intact immunoglobulin multiple myeloma (IIMM) (Chapters 17 and 18). Smouldering (asymptomatic) multiple myeloma (SMM) (Chapter 14). Light chain deposition disease (LCDD) (Chapter 29). Monoclonal gammopathy of undetermined significance (MGUS) (Chapter 13). 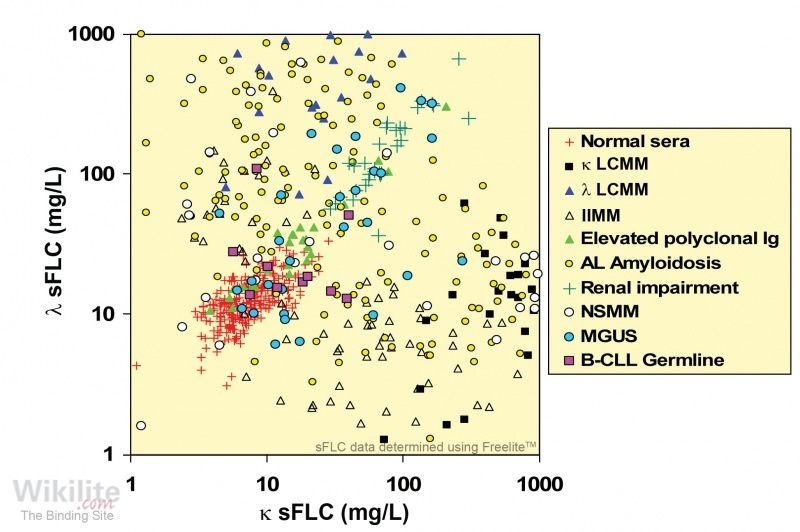 Figure 24.5 illustrates sFLC concentrations in patients with low monoclonal immunoglobulin production rates at the time of clinical diagnosis. Samples from patients with NSMM are shown as white circles which, by definition, have no detectable monoclonal proteins by both serum and urine electrophoretic tests. Hence, other patients with monoclonal sFLCs at or below these concentrations but with other types of plasma cell dyscrasias are difficult to identify by conventional tests. The figure also includes samples from many patients with AL amyloidosis and IIMM who were in remission by IFE.